I'm about to make a frank admission which may discredit any semblance of gamer cred that I currently possess; I've never played any of the Call of Duty games. Nope, not one. This is for no other reason than because I've never particularly enjoyed straight laced war shooters. If it hasn't got dragons, aliens or some other form of fantastical setting, I'm probably not interested. 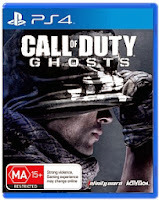 Enter Call of Duty: Ghosts. From the moment I saw that Astronaut shooty action, I knew I had to try it. Starting off in a "world gone mad" setting, CoD:G instantly piqued my interest with it's truly cinematic presentation. Running through crumbling buildings, at this point weaponless, gave cause for a raised heart rate and a handful of cuss words. Being closely followed by a zero-g encounter really got the blood pumping and started to show off those gorgeous next-gen graphics. 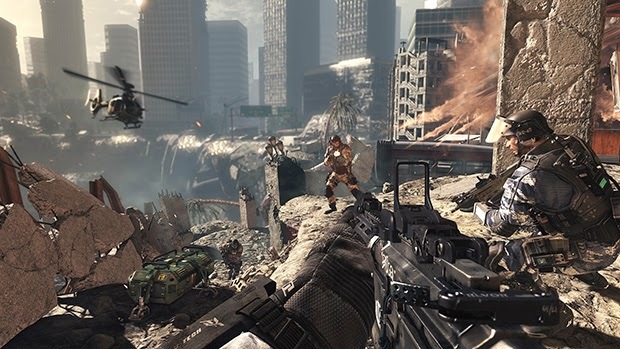 Across the next few levels, CoD:G surprises with a variety of different locations and different types of engagement. This is so much better than I ever expected. I'm generally a run n' gun type of player, and no I'm not referring to the 1993 basketball game from Konami. So CoD:G delivers in spades but what it also does is force you to engage in more clandestine operations, sneaking by guards and tanks without causing alarm. Usually these types of operations are executed at the hands, or paws, of the K9 unit named Riley. Thank the maker that they didn't name that German Shepherd "Rex" or "Fido". Using the dog is more fun than it should be. Sneaking by your enemy is one thing but chasing them down and tearing out their jugular is sadistic fun at its best and earns the game its MA15+ rating. Striking a great balance between stealth and shooty goodness, CoD:G doesn't skimp on the action and has many moments that are impressive albeit completely unrealistic. Astronauts firing off rounds in a pressurised cabin: Check. 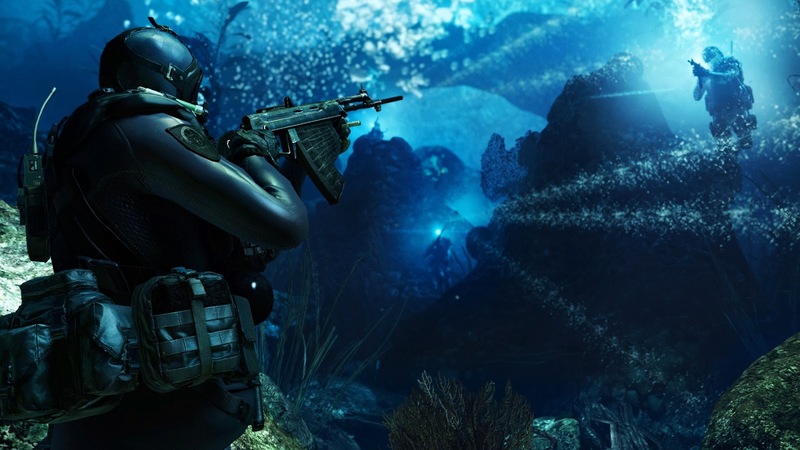 Scuba divers popping off full mags left right and centre: Check. Like a great action movie, these sort of over the top set pieces are as ludicrous as they are engaging. As long as you can suspend your disbelief and replace it with unbridled acceptance, you're guaranteed a good time. The story itself is very much akin to "America, F&*# YEAH!" but this time the "threat" isn't one that you'd necessarily expect. What we see is a united South America breaching the border and attacking the USA with its own toys. Granted, this is just another story about 'Muricans defending 'Murica but this time, the 'Muricans are actually getting their butts kicked. This in itself is a refreshing change for the norm and shows a touch of humility at the hands of writer Stephen Gaghan, director of the Oscar nominated Syriana. Add to that an awe-inspiring and pulse pounding score by composer of The Town, David Buckley, and you've got an incredibly cinematic experience which takes the best parts from first person shooters and wraps it up with a silver screen bow tie. 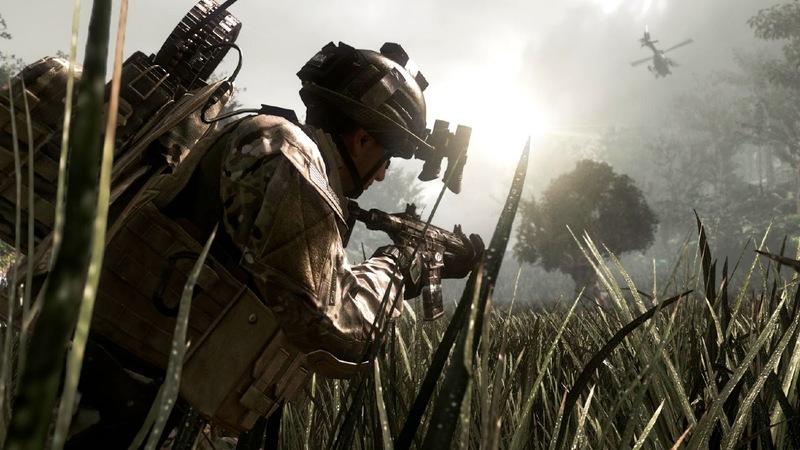 In short, Call of Duty: Ghosts is one hell of an experience. As a "noob" when it comes to the world of CoD I only lasted a few minutes on multiplayer servers before being summarily and relentlessly slaughtered all the while having my sexuality, and my mothers morals, questioned. That said, the single player campaign is brilliant fun and well worth the price tag by itself. If you're already a CoD multiplayer, you know what you're in for. Graphically, CoD looks like a very strong idea of things to come and if games are looking this fantastic on launch, imagine what we can expect in years to come! Call of Duty: Ghosts is available now on PS4, PS3, Xbox 360, Xbox One and PC.